I tried to point out in Who are you? (part I) how civilization plays a major role in ‘educating’ its citizens who they are and who they should be. This contrasts sharply with the natural intuitive way our ancestors previously acquired a secure sense of self. Religious stories have been central to every civilization’s agenda. Interestingly, Buddha’s Noble Truths offer a ‘metatruth’ that addresses this indirectly. Comprehending life is easier once we appreciate the social void created by the demise of humanity’s ancestral way of living. The agricultural revolution required a new way of doing things, and launched humanity into its civilized approach to life. 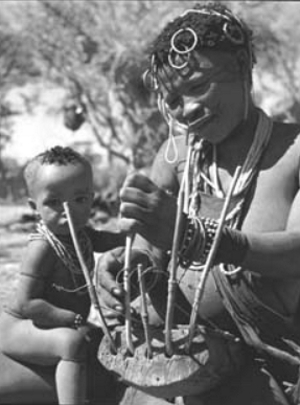 The Marshall family lived among, and wrote about, the previously unstudied !Kung people of the Kalahari Desert beginning in 1950. This excerpt from The !Kung of Nyae Nyae succinctly describes humanity’s ancestral way of living. For civilization to function, it needs to compensate for any loss of security and comfort originally and organically instilled in us via humanity’s ancestral ways. There are two aspects to this. One is the sense of comfort and security in one’s identity; the other is material comfort and security that tool use (technology) provides. The core purpose of civilization, its raison d’être, lies in maintaining and advancing security and comfort. To maintain the security of self-identity, civilization teaches us who we are and who we should strive to be. It needs to have the population on the same page, identity-wise. The cultural story we experience from infancy drums the paradigm into us. Essentially being an arbitrary, one-size fits all story, we spend the rest of our lives striving to find our proper role — our niche in the hierarchical social scheme. How well each of us succeeds probably affects mental health and general well being a great deal. Ironically, this is not yet as problematic as it could be, due to the historic commonness of everyday poverty. At best, it is a mixed blessing. We are a very adaptable species and there is the ‘you can’t miss what you’ve never had’ argument. In addition, the nuclear and extended family has certainly been a major substitute for the tribe following the agricultural revolution. However, that has become increasingly tentative over the millennia. A wealth of opportunity means we don’t have to put up with our relatives; we are free to move out and have a life of our own choosing. Indeed, moving out is a rite of passage for children now. Yes, we stay in touch: Facebook, email, Skype, holiday visits, blogs, etc., but these can’t match the close physical and emotional lifelong contact experienced by hunter-gatherers. All under heaven realizing beauty as beauty, wickedness already. All realizing goodness as goodness, no goodness already. Seen from a symptoms point of view, the fervency that religions bring in trying to ‘fix’ humanity actually belies their factual failure. In hunter-gatherer days, we didn’t need much ‘fixing’, so obviously there was scant need for religion of any sort. That said, there is the archeological record of spiritual expression going back 100,000 years or more. I’d guess that yearning arose as human cognition began disconnecting awareness from the ‘here and now’ and ‘what is’ — especially memory of a past and imaginations of a future. However, only with the demise of the old way, did tribal spirituality evolve into a tribal religion phenomenon. The persistence of tribal instincts seems both fitting and ironic! Simply put, religion is the attempt to fill the void created by the demise of the old way and the tribal security it provided. Taoism is a unique exception once we drop the ‘ism’ side of it. The first lines of the first chapter of the Tao Te Ching could not be a more honest disclaimer to the story it proceeds to lay out. I imagine this is why a Taoist worldview never evolved into a major world religion, even in its birthplace China. Frankly, it is too impartial and honest to rally tribal agendas around. This is like saying, “Everything I say is a lie”. This seems paradoxical, but as D.C. Lau put it in chapter 78, Straightforward words seem paradoxical, or as the literal says, Straight and honest words seem inside out. If you truly take the disclaimer seriously, you can’t help but be more humble and open… eventually. This links closely to civilization’s need to instill a secure sense of social unity, a pseudo tribe where the population feels connected through a cultural story, the most powerful of which being religious. However, the extremely hierarchical nature of civilization makes any sense of egalitarian unity tenuous at best. In an existential quest to feel socially secure, we “cleave” to the particular cultural story we are given to model, from childhood onward… or we rebel and opt for another equally arbitrary narrative. Instead of a truly secure sense of self, we acquire an enhanced “illusion of self” (a.k.a. ‘ego’ ) and the insecure baggage that maintaining this illusion entails. The material things we hold onto also help create and maintain this “illusion of self” substitute for the natural sense-of-self acquired prehistorically via the old way. Alas, no illusion can ever replace the organic reality of the old way. The illusion of self — ego — only makes us feel less secure down deep. Letting go of that to which we cleave would appear to be the obvious solution. However, letting go would amount to virtual suicide; that probably explains why we can’t truly just let go, but rather hang on for dear life. Moreover, any apparent letting go is actually a pseudo letting go, where we simply exchange cleaving to this for cleaving to that. Being fully aware of how things stack up doesn’t mean we can rest easy, let go, and let the world turn. Biology drives us to resolve even the irresolvable. We, or at least I, need an alternative to any futile notions of just letting go or holding out for ‘Enlightenment”. My attempt to record my observations on how things stack up is excessively word heavy, and can end up being just more stuff on which to cleave. In addition, more words usually obscures the view and misunderstandings follows. It’s a catch-22, but what can I do? Well, at least I can save the rest for the next time in a final… Who are You (Part III). I must admit, much of what I write is merely my attempt to remember! How is this different from any other story one remembers? After all, remembering is simply a cognitive ‘cleaving to‘ that easily becomes problematic, as Buddha pointed out. Well, that’s easy; remembering is necessary to remember just that. Right Comprehension and Right Resolution depend on re-memory. Not being born and raised a hunter-gatherer, the Taoist story can police itself and help me make mountains back into molehills — if I’m self-honest enough. (1) With less poverty, there is less need for people to pull together socially. You can see this effect even now in the industrial world. The increased existential tradeoffs following a rising standard of living drives individuals to seek a more personalized quest for spiritual meaning. As robotics takes over maintaining security and comfort, civilization’s raison d’être can only weaken. There will be much less need to get everyone on the same page, identity wise, to pull together to raise the barn, dig the irrigation canal, fight the barbarian invaders. This can only weaken culture’s need, and thus ability, to answer the question, who are you, and who we should be for the sake of society. Answering that question will be a pressing task in the future… and much more difficult than raising a barn or digging a well. The emotional challenges of spiritual survival will fill the void left by diminishing survival demands on the material plane. (2) If you are serious about the Taoist worldview, The old way: a story of the first people is worth serious reading and pondering over. Again, you can buy a good used copy of this and the earlier The Harmless People on Amazon for a few pennies and cost of shipping! For the deepest experience, The !Kung of Nyae Nyae and Nyae Nyae !Kung Beliefs and Rites are worth every dollar. It is. I am only halfway though, so back to it.